Biological specimens collected in clinical studies contain important data for evaluation of clinical studies. 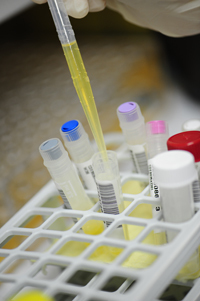 Proper management of biological specimens is essential to achieving good clinical research data quality. HKU-CTC has a team of well-trained and experienced laboratory professionals who are dedicated to providing supports on biological specimen management in accordance with a comprehensive set of SOPs. Professional consultation is available to investigators and sponsors for facilitating proper and smooth management of biological specimens in their clinical studies. Its Biological Specimen Management Unit (BSMU) is equipped with well-maintained facilities for handling, processing and storage of specimens according to study-specific conditions. Packaging of specimens for local and overseas transportation is handled by IATA-trained personnel. All specimen movements are closely traced and fully documented in updated inventory records.